The Solidarity Center supports all Iraqi trade unions in their efforts to establish their human rights as workers, in law and in practice: the General Federation of Iraqi Workers (GFIW), the General Federation of Iraqi Trade Unions (GFITU), the Federation of Workers Councils and Union in Iraq (FWCUI), the General Federation of Workers and Unions in Iraq (GFWUI), the Iraqi Federation of Oil Unions (IFOU) and the Kurdistan United Workers Union (KUWU). 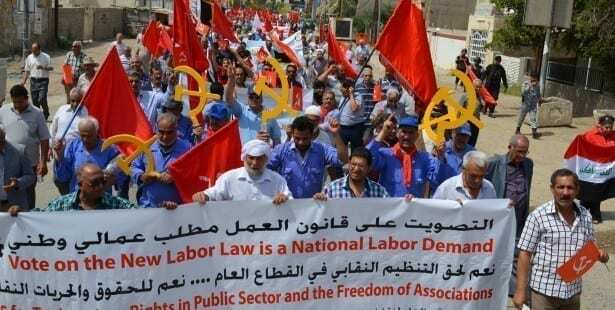 Since the fall of Saddam Hussein’s regime in 2003, unions in Iraq have been advocating for the passage of a new labor law and a new trade union law that protect the rights of workers. In August 2015, the Iraqi parliament passed a new labor law, which is in line with International Labor Organization (ILO) conventions and based on the amendments to the draft recommended by the unions. This significant victory for workers expands coverage of the labor law to all workers not covered under the country’s civil service law; recognizes trade union pluralism and the right to strike; protects against sexual harassment on the job—the first time a law has done so in Iraq—and improves provisions related to discrimination, migrant worker rights, child labor, forced labor and collective bargaining. Together with the support of civil society, the Iraqi labor movement joined together to advocate for the law with the Ministry of Labor and Social Affairs and Parliament’s labor committee. Such an inclusive process that involves citizen participation in the development of new legislation is an important step for Iraq’s democratic development. 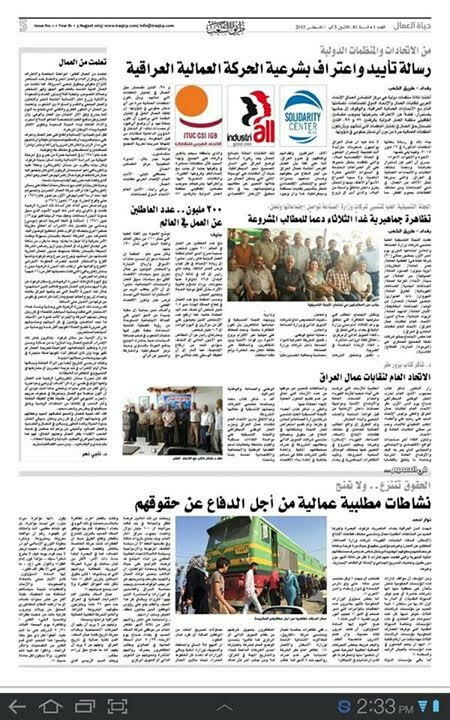 The Solidarity Center is now working with Iraqi unions to continue the momentum by replicating the same inclusive process in providing input into a proposed social security law and a new trade union law that will enable all workers in Iraq to form and join unions and bargain collectively. The Solidarity Center works with Iraqi unions to promote gender inclusion in the labor movement, as it does globally, breaking down initial resistance from male union leadership. The Solidarity Center is training women activists on outreach, organizing and mobilizing women workers, and is helping men and women leaders make space for and encourage the participation of women in the labor movement. As a result, women increasingly are serving in leadership positions and unions are more actively recruiting women and creating committees and elected positions for women’s participation.